What is the difference between Convert and Upload Online? Convert: Convert to local html, zip, app flipbook to read offline, or upload to your own web hosting to publish the flipbook on the web. 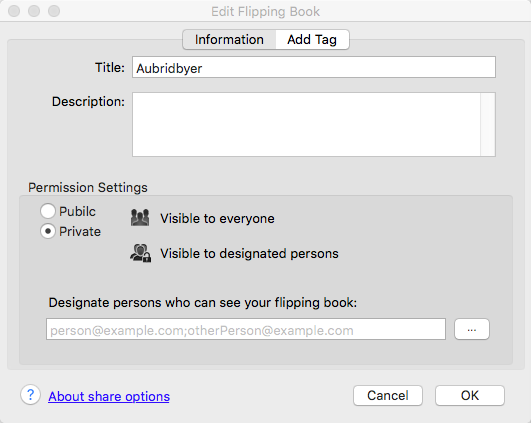 Upload Online: Upload the flipping book to our server directly after importing PDF file and customize the flipbook. 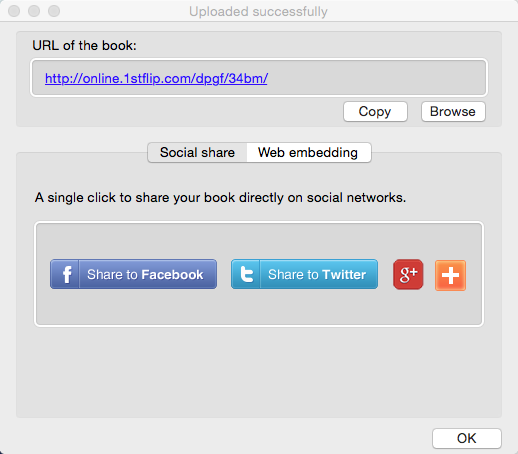 You can get the unique URL of the flipbook and share to social network directly. What is the difference between the 3 output flipbook formats? 1stFlip Flipbook Creator supports 3 output flipbook formats: html, zip, app. HTML format contains a .html file, a .swf file and a folder named “files”. You can upload all these to your website for readers to view. Zip format is the zipped version of HTML format, allowing you to send it as attachment to other people. All they need to do is unzip it and read locally. App format is an application running on Mac. .html and .zip also supports mobile versions, namely, readers can open the flipbook in the browser of iPad, iPhone, and Android devices. When I launch it, the main viewing area is blank except for a "blocked plug-in" message? Can I make the flipping book auto-flip? Yes. In the setting panel, type “auto” in search box, then the Auto Flip option appears. Check “Enable”. Flip Interval 3 means page will flip after 3 seconds. Play Count means how many times the flipping book auto plays. How to import certain pages of a PDF file? There is a Custom option, enter pages you want to import, such as: 2, 5, 8, 12-35. With the preview window you can scan each page and then decide whether to import or not. How to make mobile version flipbooks? And how to read flipbooks on mobile devices? Check the “Also make mobile version.” option after you choose the output format. Only .html and .zip format supports mobile version while .app format not. Then upload to the server to get the exclusive url of the flipbook. Open the url on your mobile devices’ browsers, then you can read the flipbooks on mobile devices anywhere and anytime you want. How to track the traffic of flipbooks with Google Analytics? After importing PDF files, enter your Google Analytics ID in the Settings interface. Or add Google Analytics code. Upload the flipbook online, login your Google Analytics account, and you can track the flipbook traffic. How to manage books in the Online Library? First you need to upload the flipbook to the Online Library. 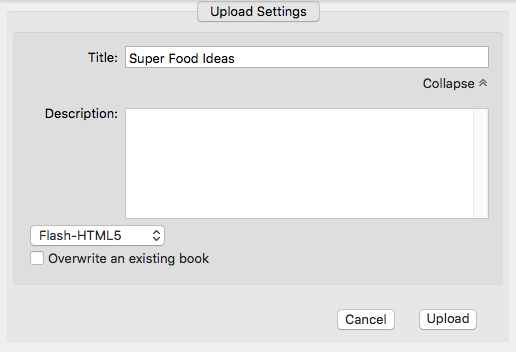 Import PDF files, choose templates and scenes, or change some other settings (optional), then click the Upload button. You need to create an account with your email first. After successful upload, click Online Library button to open the window. How to upload flipbook to my website or 1stFlip Server? For users who own websites, you can upload flipbooks to your website with FTP. First, log in your website with FTP, upload all output files you get after you click Convert button. For example, if you choose .html format, the whole output file contains a folder named files, a .html file, and a .swf named book. For users who don’t have websites, use the Instant Web Publishing Service of 1stFlip Flipbook Creator. After importing PDf files and finishing all settings, click the Upload button instead of Convert button, create an account with your email, add title and description, select a template for mobile version if you want readers to view your flipbook on mobile devices, then click Upload button and the uploading begins. After uploading, you will get the URL of the flipbook. One-click to share the flipbook to social networks or copy the embed code to webpages or blogs. How to make my flipbook available to certain users? Choose Private, then enter email addresses, and click OK. When readers attempts to access to your flipbook, they will be asked to enter the email address. Only those enter the same email with you set can open the flipbook. What is Instant Web Publishing Service? We add the Instant Web Publishing Service to allow you easily upload flipbooks online. See more details: http://www.1stflip.com/support/web-publishing-service.html. What is the difference between the trial version and registered version? Trial: Advertising will be visible on your flipbook. Registered: No advertising is added to your flipbook. Trial: Links in the PDF file don't work in the flipbook. Registered: Links in the PDF file are available in the flipbook. Trial: You can use the free version for 15 days. Registered: Use it forever. Enjoy all free updates and technical supports. How to use the Upload Online function? After importing PDF file and customize the flipbook, you can upload the flipbook to our server directly by clicking the Upload Online button. You need points to publish flipbooks with our Instant Web Publishing service and keep your flipbooks available online. You will get 5 points after creating your account. Click the Purchase link on the top right corner of the Book Management window to purchase points. $1 per point. Purchase more, save more. How to get my license key after purchasing? You will receive an email contains the license key and download URL after your order is finished. Download, install and run 1stFlip Flipbook Creator, click the Register button and copy paste the name and code to relevant area to register. I have lost my license key, how to retrieve it? Any issue related to the license key, please send email to team@1stflip.com. We will reply you with 24 hours on workdays. How to upgrade 1stFlip Flipbook Creator to the latest version? We will send you emails including the download URL each time we release the new version. Just click the download URL to get the latest version. Or you can download it from our website. You license key is valid forever. 2014 © 1stFlip. ALL Rights Reserved.